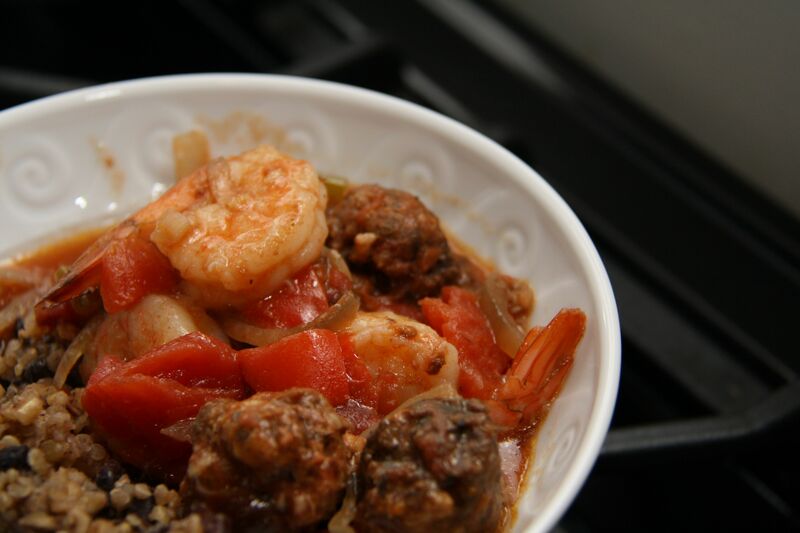 Here’s a great slow cooker recipe — Cajun stew with andouille sausage and shrimp. 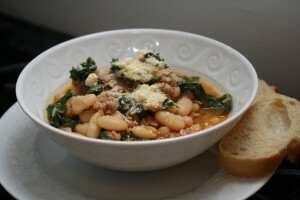 The dish has great flavor and a mild heat from the sausage and cayenne pepper. Like my favorite slow cooker recipes, this one requires little prep work — only a bit of chopping. A few notes: I used fresh andouille but I’d recommend smoked. It will be easier to slice and will stay together through the cooking process better than fresh. Serve the stew with some rice or quinoa as a side. Don’t forget the okra like I did (oops!). The dish was still tasty without the okra but I’m sure it would have been a nice add. In a 5- to 6-quart slow cooker, place sausage, onion, garlic, celery and bell pepper. Sprinkle with flour and toss to coat. 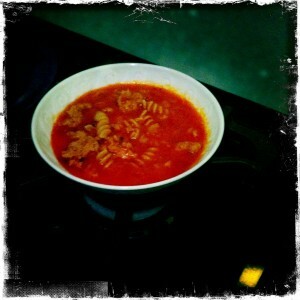 Add tomatoes and their liquid, ½ cup water and cayenne; season with salt. Cover and cook until vegetables are tender, 3 ½ hours on high or 7 hours on low. Add shrimp and okra, then cover and cook until shrimp are opaque throughout, 30 minutes on high or 1 hour on low. To serve, scoop spoonful of rice into individual serving bowls and place stew on top. I found this recipe on Pinterest! Pinterest is basically an online bulletin board that allows you to “pin” and categorize things you like across the web. You can follow people and see their pins and can follow categories you might be interested (e.g., food). 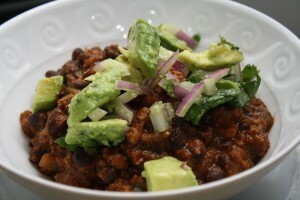 I’m finding Pinterest is a great way to organize recipes I’m interested in making. I love how visual it is — much more effective than bookmarks when I’m trying to decide what to cook. This recipe, as its title implies, basically tastes like lasagna. It is a tomato, sausage and pasta soup but has something the recipe author calls “cheesy yum” on the bottom of the bowl which is a mixture of ricotta, parmesan, and shredded mozzarella. When you mix the soup with the cheesy yum it looks and tastes like lasagna filling. Delish! You can lighten the dish up a bit with turkey sausage, whole wheat pasta, and part-skim ricotta. I know I was extolling the virtues of the Barefoot Contessa’s Tortilla Soup not that long ago but I think I love this meatball tortilla soup from Cooking Light even more! The soup has so much flavor from the roasted jalapeños, roasted red peppers, and chipotle peppers in adobo sauce. Just a few notes: I used frozen corn I defrosted and then roasted. I had some leftover Yukon gold potatoes so I used those rather than red-skinned potatoes. Lastly, I used chicken stock which I think added some richness to the broth. 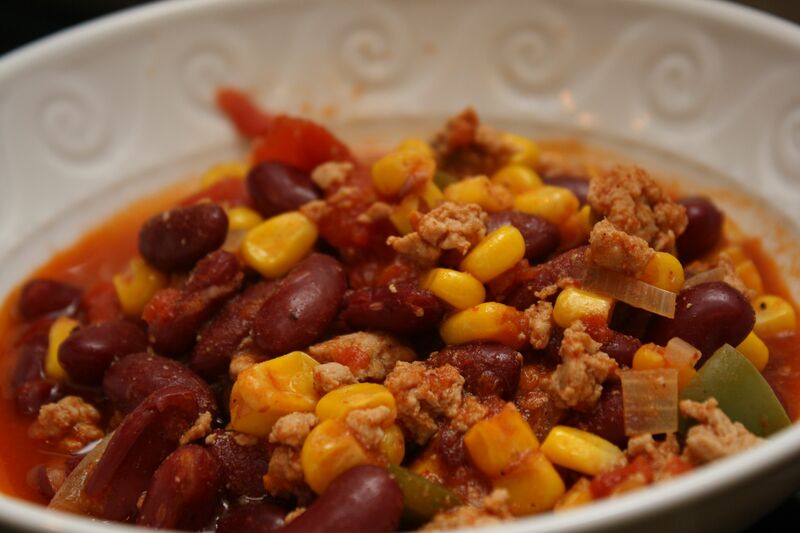 If you want to lighten the recipe, try ground dark turkey meat. The soup was great the next day — I added a little more chicken stock to get a couple more bowls out of the leftovers. The soup definitely is spicy so it is perfect for keeping you warm on frigid day like today! Cut jalapeños and bell pepper in half lengthwise; discard seeds and membranes. Place pepper halves, skin sides up, on a foil-lined baking sheet. Arrange corn on baking sheet with peppers. Broil 4 to 6 minutes or until blackened, turning corn once. Place peppers in a paper bag; fold to seal. Let stand 15 minutes; peel. Mince jalapeños, and coarsely chop bell pepper. Cut corn kernels from cobs. Set aside. Combine 1/4 teaspoon salt, 1 garlic clove, panko, and the next 3 ingredients (through chipotle chile) in a large bowl, and gently mix until just combined. With moist hands, shape the meat mixture into 24 meatballs (about 2 tablespoons each). Place a Dutch oven over medium-high heat. Add oil to pan; swirl to coat. Add meatballs to pan; sauté for 8 minutes, turning to brown on all sides. Remove from pan. Add onion, potatoes, and carrot to pan; sauté 5 minutes, stirring occasionally. Add remaining 5 garlic cloves; cook 1 minute, stirring constantly. Add peppers, broth, and 2 cups water; bring to a boil. Reduce heat; simmer 20 minutes or until vegetables are almost tender, stirring occasionally. Return meatballs to pan. Add remaining 1/2 teaspoon salt and corn; return to a simmer. Cook 10 minutes or until meatballs are done. Ladle 1 1/2 cups soup into each of 6 bowls; top each serving with 4 teaspoons Monterey Jack cheese, 2 teaspoons cheddar cheese, and 4 teaspoons cilantro. Top evenly with tortilla strips. My mother has been raving about this Barefoot Contessa recipe for some time. The cool fall weather prompted me to finally make it! 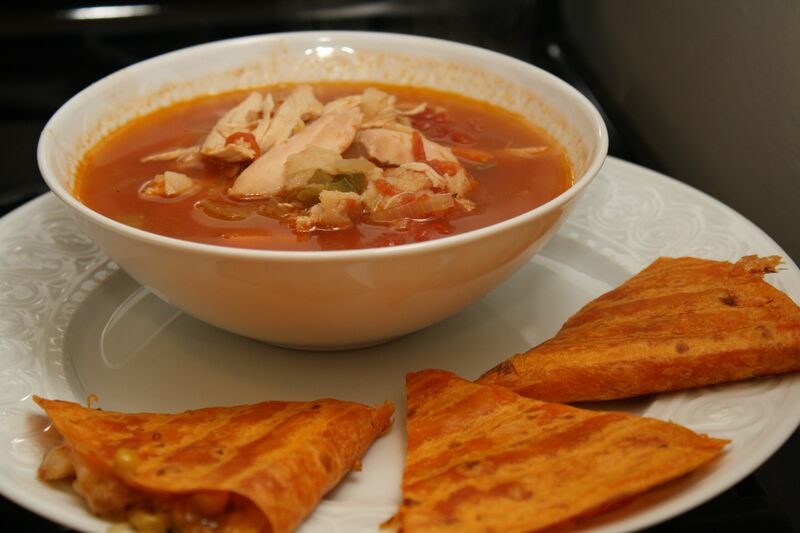 This Mexican Chicken Soup — often called Tortilla Soup — has great flavor from the tomato, jalapeno, cumin, and coriander. 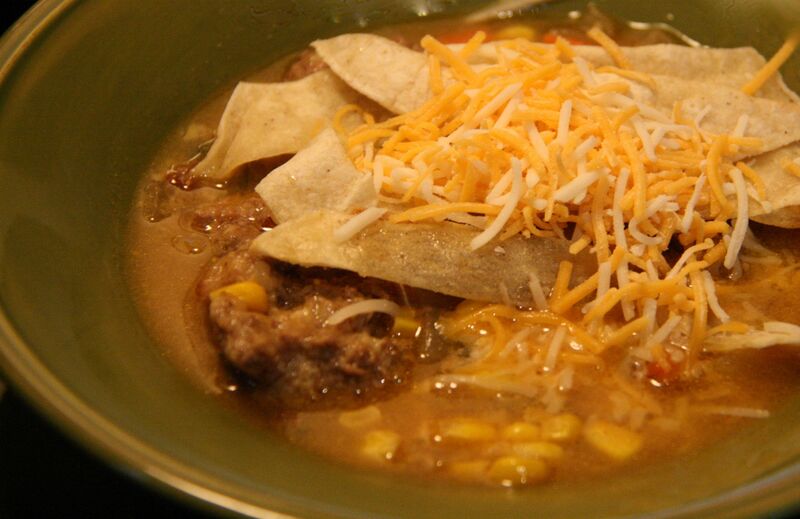 Tortilla strips actually serve to thicken the soup. Just like her chicken salad recipes, the Barefoot Contessa roasts and then shreds bone-in, skin-on chicken breasts. The chicken turns out so moist and delicious. Don’t forget the garnishes — avocado, shredded cheese, and crushed tortilla chips. I served the soup with a simple cheese quesadilla for a delicious dinner! There is some leftover soup in our freezer. Looking forward to having it on a cold evening! In France, a brasserie is a café doubling as a restaurant and serving single dishes and other meals in a relaxed setting. A bistro is a familiar name for a café serving moderately priced simple meals in an unpretentious setting, especially in Paris; bistros have become increasingly popular with tourists. When used in English, the term bistro usually indicates either a fast casual dining restaurant with a European-influenced menu or a cafés with a larger menu of food. Regardless of whether it is the more casual bistro or the brasserie, casual French dining used to be a staple of ours before having Charlotte. In our neighborhood we have the amazing Pastis just a couple of blocks away. Even when we do have a babysitter, the long wait at Pastis doesn’t usually fit our schedule. And, while they do deliver, it’s jut not as good. I love many of their dishes but they have a delicious French onion soup and a wonderful warm goat cheese salad. Last night’s dinner was my attempt to have a little taste of Pastis (and Paris) at our kitchen table. 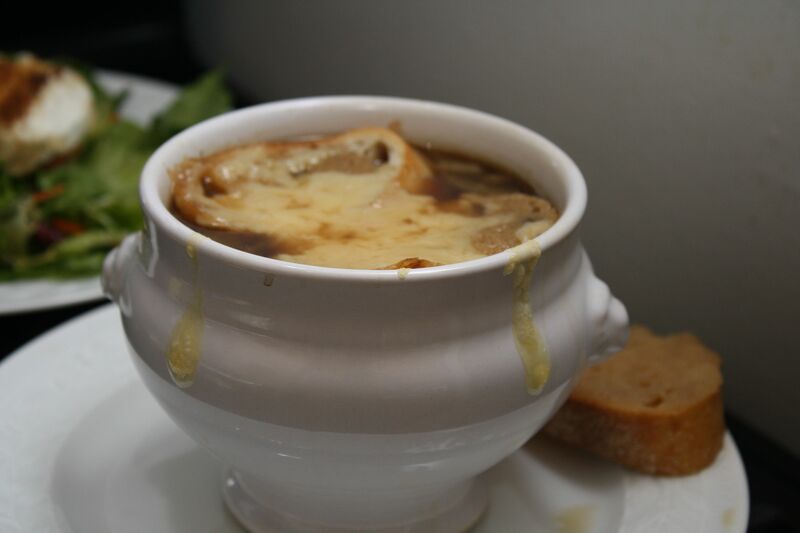 I was skeptical of this onion soup recipe because it only takes 40 minutes and you saute chopped onions (as opposed to sliced) in a dry non-stick skillet. But the recipe was very tasty! I definitely needed to add some salt and pepper after the soup reduced. I used Applejack brandy and Gruyere cheese. How bad can anything be when topped with a baguette slice and melted cheese! And, I actually forgot to add the butter so perhaps it would have even been better! For the goat cheese salad I just sliced some goat cheese and then coated the slices in breadcrumbs. 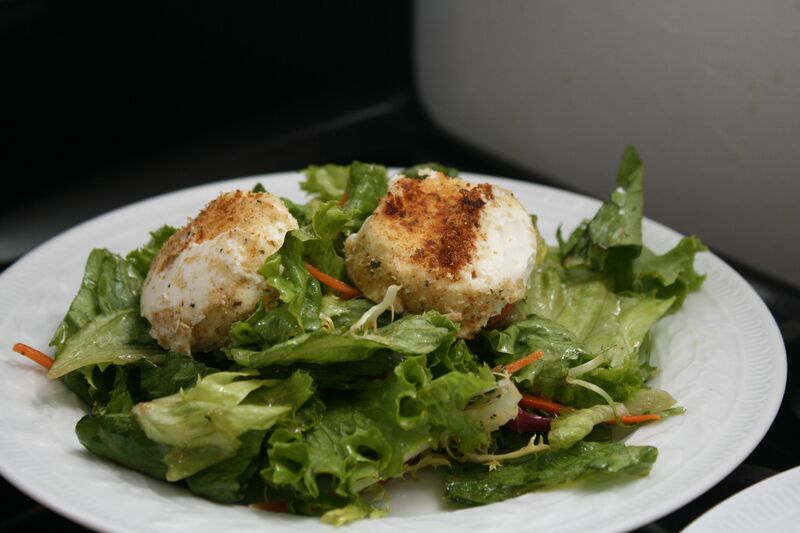 The breaded goat cheese cooked in a small frying pan for a couple of minutes per side to brown the breadcrumbs and warm the cheese. The green salad was dressed in a simple vinaigrette of red wine vinegar, extra virgin olive oil, Dijon mustard, and salt and pepper. Our delicious dinner, along with a tasty Côtes du Rhône, gave us a little taste of France right here in apartment 104. Preheat oven to 450°F. Cook onions in a 12″ nonstick skillet over high heat, stirring constantly, until soft and caramelized, about 15 minutes. Add butter and toss onions to coat. Remove pan from heat and stir in Calvados. Return pan to heat and continue cooking until Calvados is absorbed, about 30 seconds. Add stock and bring to a simmer. Simmer until soup is reduced to 4 cups, about 5 minutes. Season soup to taste with salt and pepper. Place ramekins on a rimmed baking sheet. Divide soup among ramekins. Top each ramekin with 1-2 slices of bread. Sprinkle 1/4 cup cheese over each. Transfer baking sheet with ramekins to oven and bake until cheese is bubbly and browned in spots, about 4 minutes. It has been a while since I posted. I have been cooking but between work, some illness making its way through our family, and taking a much needed vacation, there really hasn’t been much time to devote to my blog. Hopefully that will change soon! I made this super easy beef stew a few weeks ago — you basically just throw all the ingredients in a pot, bring to a boil and then put in the oven. I was a bit skeptical of the recipe because it does not call for you to brown the beef as most stew recipes do. 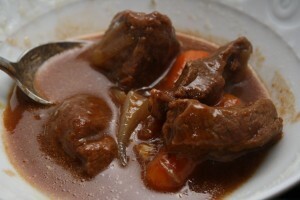 But the stew was very flavorful, the beef tender, and the veggies perfectly cooked. Make sure to have some crusty bread for dipping. Add onions, potatoes, carrots, garlic, bay leaves, and 3 cups water. Bring to a boil. Cover, transfer to oven, and cook until meat is fork-tender, 2 to 2 1/2 hours. Remove bay leaves and, if desired, season with salt and pepper before serving. Last year the way in which our half-steer was butchered left us with a ton of ground beef. This year, it looks as if we have a TON of stew cubes. I love Giada’s Beef and Butternut Squash Stew but made that couple of weeks ago. I decided to look through some Barefoot Contessa recipes because no one does comfort food like she does! 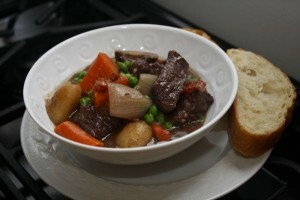 This classic beef stew recipe in unbelievable! The meat marinades overnight in red wine with some smashed garlic cloves and bay leaves which tenderizes the beef and lends great flavor to the stew. The sun-dried tomatoes, rosemary, and Worcestershire sauce add some depth to the dish. And, as a pea lover, I really enjoyed the addition of some frozen peas before serving. This is my new go-to recipe for a classic beef stew! Combine the flour, 1 tablespoon salt, and 1 tablespoon pepper. Lift the beef out of the marinade with a slotted spoon and discard the bay leaves and garlic, saving the marinade. In batches, dredge the cubes of beef in the flour mixture and then shake off the excess. Heat 2 tablespoons of olive oil in a large pot and brown half the beef over medium heat for 5 to 7 minutes, turning to brown evenly. Place the beef in a large oven-proof Dutch oven and continue to brown the remaining beef, adding oil as necessary. (If the beef is very lean, you’ll need more oil.) Place all the beef in the Dutch oven.